The challenges related to providing first class, accessible transportation for those among us who are living with disabilities that render the use of conventional modes of public transportation inappropriate to their needs is at times daunting. Costs continue to escalate and keeping pace with expenses related to specially equipping vehicles, providing professional drivers to operate them, fleet maintenance programs to ensure vehicle safety, together with fluctuating fuel costs, place pressures on a service business operating as a non profit. General Donations are those which are not attached to any specific fund raising initiative. 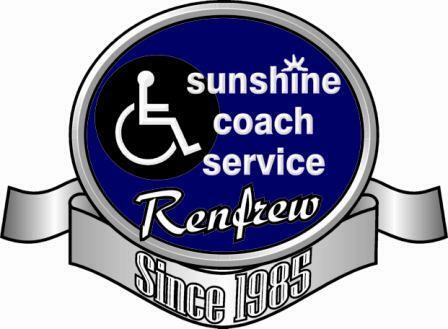 These donations are applied directly to assist in defraying operating costs and provide crucial help in ensuring that Sunshine Coach service remains vaiable and that our fares remain affordable. Consequently, all of our clients benefit from your generosity are General Donations are welcome at any time during the year. Any donations of $10.00 or more will be issued a charitable donation tax receipt by Friends of the Disabled (Renfrew) Inc. upon receipt of your payment.